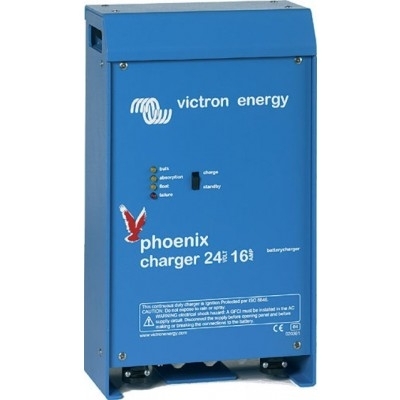 The Phoenix Charger features a microprocessor controlled ‘adaptive’ battery management system that can be pre-set to suit different types of batteries. The ‘adaptive’ feature will automatically optimise the process relative to the way the battery is being used. The storage mode kicks in whenever the battery has not been subjected to discharge during 24 hours. In the storage mode float voltage is reduced to 2,2 V/cell (13,2 V for 12 V battery) to minimize gassing and corrosion of the positive plates. Once a week the voltage is raised back to the absorption level to ‘equalize’ the battery. This feature prevents stratification of the electrolyte and sulphation, a major cause of early battery failure. Every Phoenix Charger is ready to communicate with a computer through its RS-485 data port.